How to make a paper plate turkey for Thanksgiving, with construction paper hand print tail feathers, and construction paper feet. This is a lovely interactive art project for youth groups and classrooms. 1. Color the front of two paper plates in brown paint or crayon. Set aside. 2. With the pencil, trace around children’s hands onto construction paper. Cut out the hand prints. 3. Fold a small piece of yellow construction paper and cut out a triangle against the fold to make a beak. 4. Draw a foot shape onto the remaining folded yellow construction and cut out matching feet. Cut a small, thin oval from red construction paper, making the oval at least as long as the yellow beak. 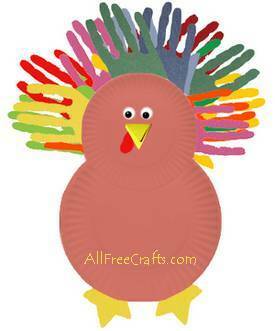 Glue the small paper plate to the top area of the larger paper plate to make the turkey’s head and body. Turn the paper plates over, so you are looking at the back. Glue construction paper hand prints all around the smaller paper plate, so the fingers of the hands stick out at the front like turkey tail feathers but most of the palms are glued down. Add another layer of hand prints, gluing down each one between two of the hand prints on the first layer so that all the colored fingers can be seen looking from the front. Glue the red oval wattle to the back of the yellow triangle beak. Glue the beak to the center of the face. Glue or draw two eyes above the beak. Finally, glue two yellow feet to the bottom of the large paper plate.